Some 7,500 people representing more than 200 religions gathered from around the globe were boisterously engaged at the Toronto Convention Centre in a week-long repast [last November]. The feast included interfaith plenaries, seminars, workshops, panel discussions, worship, meditation, artistic performances, a film series, and much more. All the while a different kind of interfaith activity — subtle and low-key — was going on a few miles away, at the Aga Khan Museum. It was created by His Highness the Aga Khan, the current spiritual leader of the Shia Imami Ismaili Muslim community, often referred to as a modern-day “Medici.” He is the community’s 49th hereditary Imam and a direct descendant of Prophet Muhammad. He is both a patron of the arts and a creative force, having spearheaded the construction of some of the most noteworthy architectural sites in the world, including hospitals, universities, museums, and gardens. The Aga Khan has also initiated one of the most prestigious architectural prizes in the world, the Aga Khan Award for Architecture, and his architectural and cultural footprint is especially noteworthy in Canada. Landmark sites include the Aga Khan Museum and Ismaili Centre in Toronto, the recently inaugurated Aga Khan Gardens in Edmonton, and the Delegation of the Ismaili Imamat building in Ottawa. Also in Ottawa is the Global Centre for Pluralism, funded by the Aga Khan and the Government of Canada, a tribute to the model pluralism that characterizes a country which has a history of liberal immigration and recently became a welcoming home to thousands of Syrian refugees. The tour group poses for a photo while visiting the Aga Khan Museum. 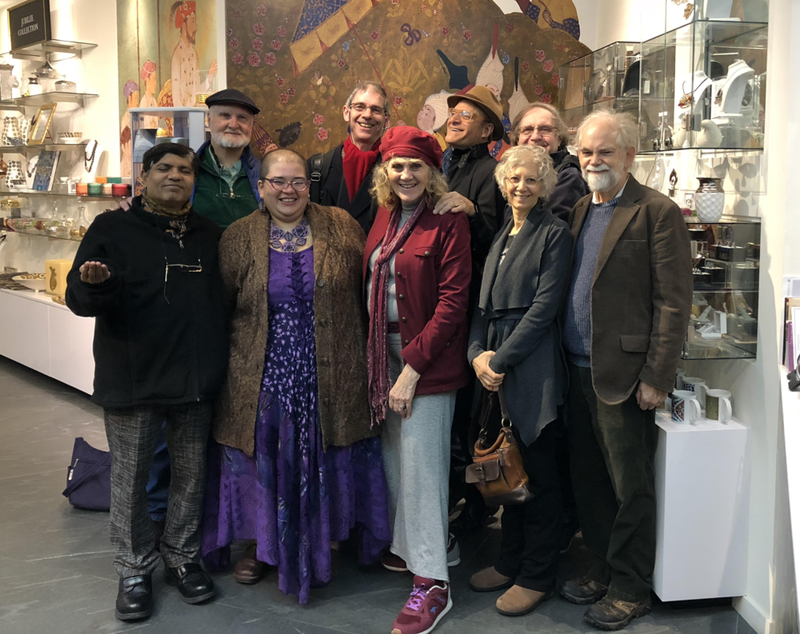 Thirteen who attended the Toronto Parliament of the World’s Religions this year chose to stay a few extra days to enjoy the art and architecture of the city. Mostly from the United States, our group included interfaith activists from India, Holland, and Germany. We were invited first to visit the Ismaili Centre designed by Indian architect Charles Correa, a building which seamlessly integrates classical Islamic design with modern materials and sensibilities. Our next stop was the Aga Khan Museum, now a popular visiting place for local high school students of all ethnic backgrounds who descend on the museum daily in large, noisy groups. While we were there, the students, like us all, were irresistibly drawn to the gold, ruby, and emerald encrusted daggers in the special exhibit called Emperors & Jewels: Treasures of the Indian Courts, from a private collection in Kuwait. Magnificently adorning themselves to feast and to fight, the Moghuls of India and their contemporaries in the Deccan Sultanates embraced the jeweled arts. The exhibition pays tribute to their love of opulence and celebrates the artisans who blended Indian, Persian, and Central Asian traditions as effortlessly as they combined precious stones, jade, and gold. In the melding of metallurgy, ceramics, glass and stone, we witnessed the results of an alchemical creativity that occurred when diverse cultures were encouraged to inspire one another to great heights. This reflected interfaith and intercultural engagement at its best, just as we had experienced at the Parliament. In one of the main exhibit halls we watched, fascinated, as a world map spanning an entire wall slowly lit up like a Christmas tree, reflecting the historical advance of Islam from city to city, country to country, conquest to conquest, dating back from Prophet Muhammad's time in the sixth century till today. The sprawling map reminded us that Indonesia, not the Middle East, is home to the largest concentration of Muslims in the world. Nazira Virani, our extremely knowledgeable tour guide, was born in Uganda and migrated to Canada. She explained the Aga Khan’s penchant for fostering great architectural and environmental design. “His Highness believes our environment is extremely important for our mental well-being.” As an example, she cited one of his projects in Al-Azhar, the centre of historic Cairo, Egypt (a city founded by the Aga Khan's ancestor, Imam al-Muizz, in 969 C.E. ), where a massive rubbish heap was transformed into a beautiful 74-acre city park and gifted to the city as an oasis in a metropolis lacking green spaces. This article was first published on 15 November 2018 by The Interfaith Observer. Ruth Broyde Sharone is an interfaith leader, documentary filmmaker, journalist, and author, and has been honoured internationally for her contributions to cultural education, peace, and justice. She is co-chair emeritus of the Southern California Parliament of the World’s Religions (SCCPWR) and the creator of INTERFAITH: The Musical.